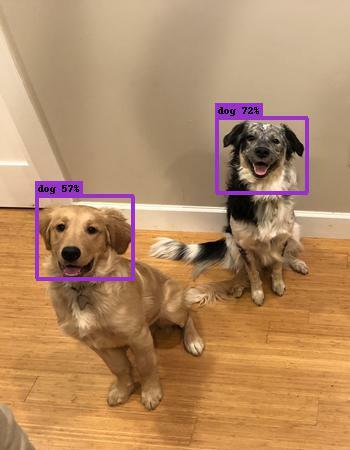 This particular model was instructed to detect instances of animal faces. The notion of localization is here provided by bounding boxes around the instances. 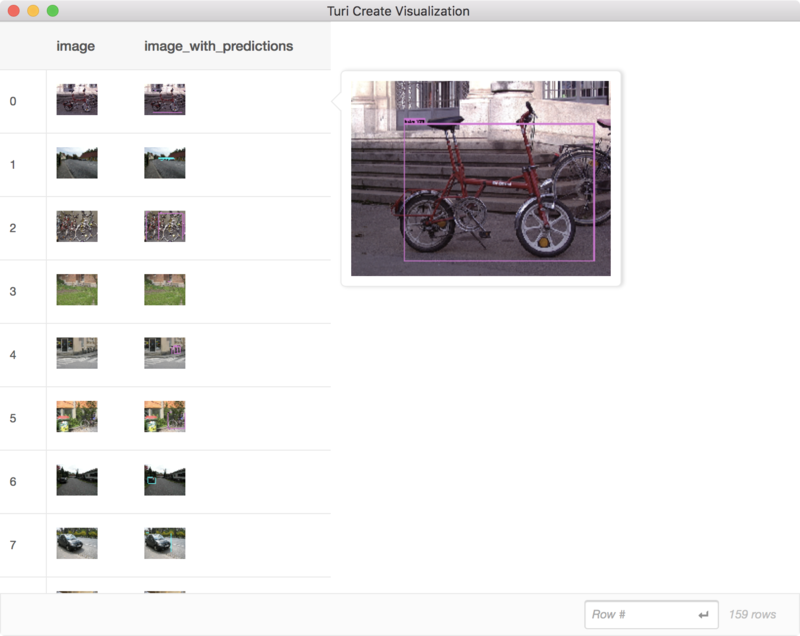 In this example, the goal is to predict if there are bikes or cars in a picture and where in the picture they are located (Go to Data Preparation to find out how to get ig02.sframe). In this particular example, we chose ball and cup to be object classes. Each instance of these objects therefore gets a ground truth bounding box. In this scenario we are not interested in detecting fruit, so we leave them unmarked. You should decide a list of object classes of interest, preferably in advance. If you start marking up all potentially interesting objects in your training images, you may end up with classes with very few samples. Alternatively, you can annotate as much as you want and then pass a list of classes to create using the classes parameter; object instances not covered in this list will simply be ignored. It is customary for bounding boxes to tightly surround instances. However, this is only a convention and it is entirely up to you and your training data to define how instances should be represented as boxes. If you for instance only need to predict the center of objects, feel free to set all widths/heights to a token value (e.g. 100) in your training data. It is up to you to choose how many bounding boxes you define for each image. However, try to be consistent with your notion of instances. If you are trying to detect persons, then every occurrence of a person should warrant a ground truth bounding box. If you leave some persons unmarked, the model can get confused why some persons are marked as positives (presence of an instance) while others are marked as negatives (absence of an instance). If you want, you may include images without any bounding boxes whatsoever (pure negatives), granted that no instances appear in those images. This can be an effective way of reducing false positives. 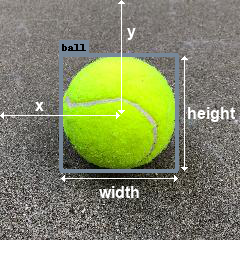 For instance, if you train a model to detect balls and the training set you provide never includes other round objects, you may find that your model starts assigning high confidence of ball to other similar objects. In the photo above, the presence of an apple and a clementine may actually help to prevent such mistakes, even though they are not marked up explicitly. The data should be varied. Use many photos of your object instances in different contexts, from a variety of angles and scales, lighting conditions, etc. If you only have photos of your object from the same pose (e.g. person facing the camera), then at test time it will likely fail to make a detection if a different pose is presented (e.g. person looking away). Unless you specifically want the detector to have such behavior, you will need to vary the pose in your training data. If you use broad categories of objects, such as a cup or dog, include a wide variety of types of cups and breeds of dogs. The ground truth data should be representative of the actual use case data. For instance, if you take photos of a catalog of products only inside a warehouse, it may not work well if your users are making predictions inside a store. You can expect to need at least 30 samples (bounding boxes) per object class, but even that will be too few for many challenging tasks. For high quality results, plan to have closer to 200 samples per class. Model creation may take time. If you do not have access to a GPU, it can take as much as a day to train a good model. Progress will be continuously printed to give you a sense of the time it will take. The number of training iterations is determined automatically based on the size of your dataset. If you want to lower this value to make model creation faster, you can change it by manually passing max_iterations to create. This may lead to a model with inferior prediction results. To know for sure, we will soon discuss how to do quantitative model evaluation. Before that, let us make some predictions on images so far unseen by the model. Another useful way to inspect predictions is to convert them to stacked format, which is an SFrame where each row represents a bounding box (see Advanced Usage). It is a value between 0 and 1 (or 0% and 100%), with higher being better. Use the quantitative metric primarily as a relative measure between different models (training time, sample size, etc.). A single value will not give you a sense of whether or not the detector is good enough for your use case. Rely on qualitative prediction examples for that. However, if you train a new model that improves your mAP metric from 47% to 55%, you know that the new model is stronger without having to look through images and make a difficult judgement call. We describe this metric in more detail in the Advanced Usage section, where we also cover using Core ML to deploy your detector to iOS and macOS. 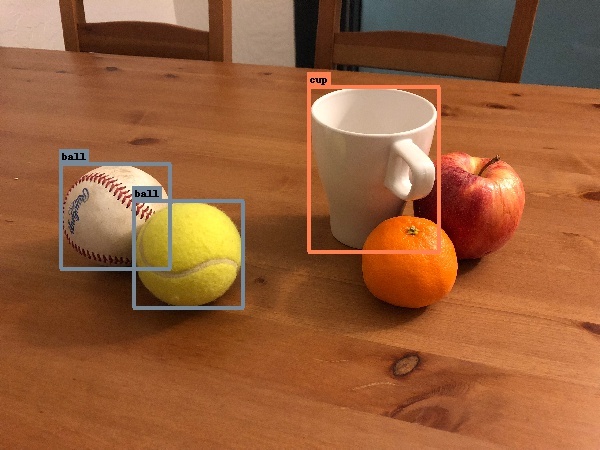 GPUs can make creating an object detection model much faster. 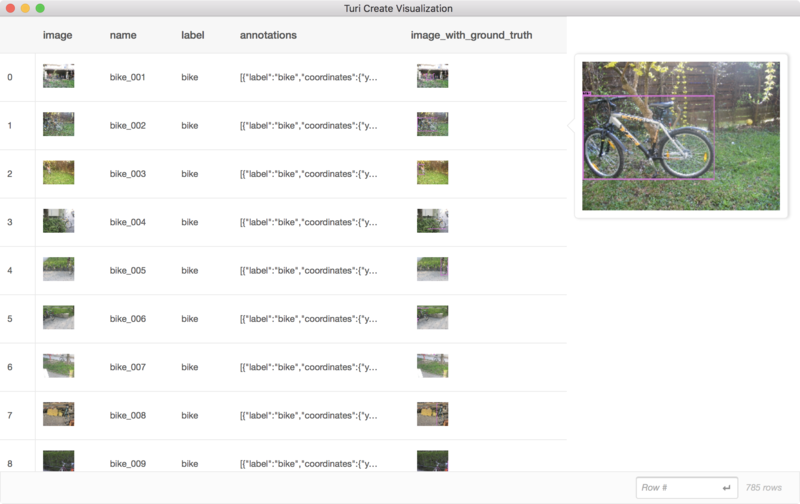 If you have macOS 10.14 or higher, Turi Create will automatically use an available discrete GPU. (Integrated Intel GPUs are not supported.) If your Linux machine has an NVIDIA GPU, you can setup Turi Create to use the GPU, see instructions.